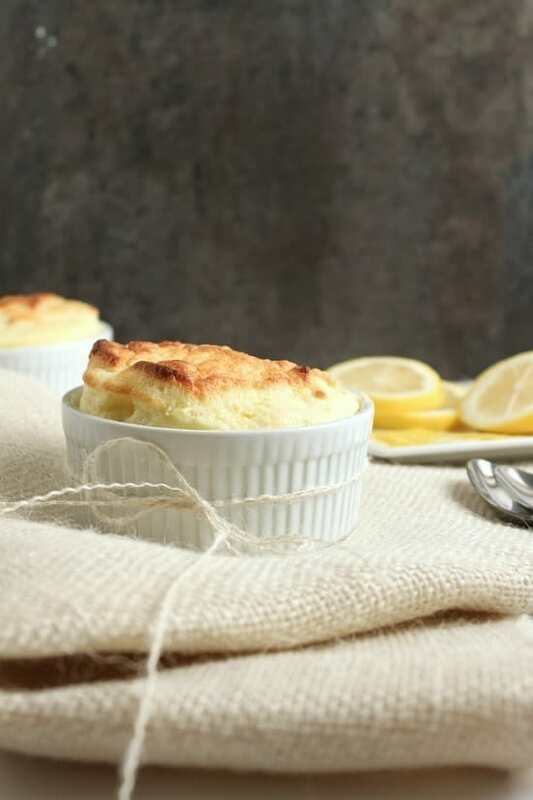 This fluffy lemon souffle is the perfect light dessert for any warm-weather occasion. Full of a clean and fresh lemon-y punch of flavor! There comes a time when you really need to just step out of your comfort zone and do things that maybe you’ve never done before. Yes, we know I can make brownies. We know I’m only a shot glass (or two) from an amazing cocktail. But I’m not growing by making these staples of mine. I’m not becoming versed in the kitchen. 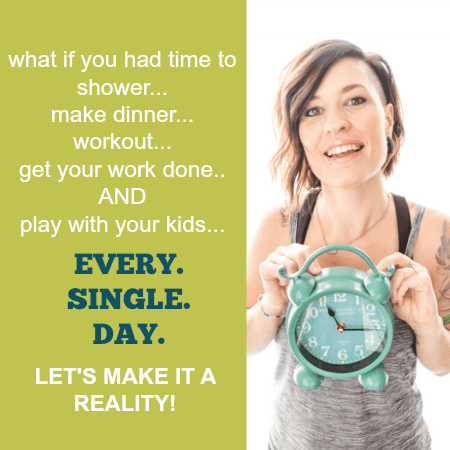 I’m just making different versions of the same recipes over and over again. So this one’s all about me trying something new. Before this week, I had never made a souffle. Hell, I had never even tasted a souffle before this week! But something told me I just had to try it for myself. It was when I first saw this insanely beautiful and fluffy chocolate souffle that it hit me. I had to do it. But I had to make it different. Something that suits the season. 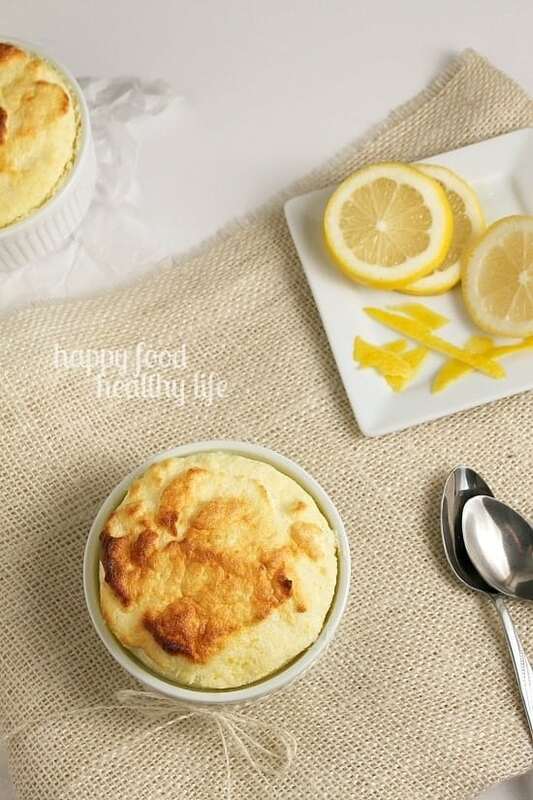 I know my souffle isn’t nearly as tall and beautiful as bon appetit’s version, but that is not the point here… bring your eyeballs back to the lemon! Oh. My. Gawd. I cannot get enough LEMON! My wife would kill me right now. 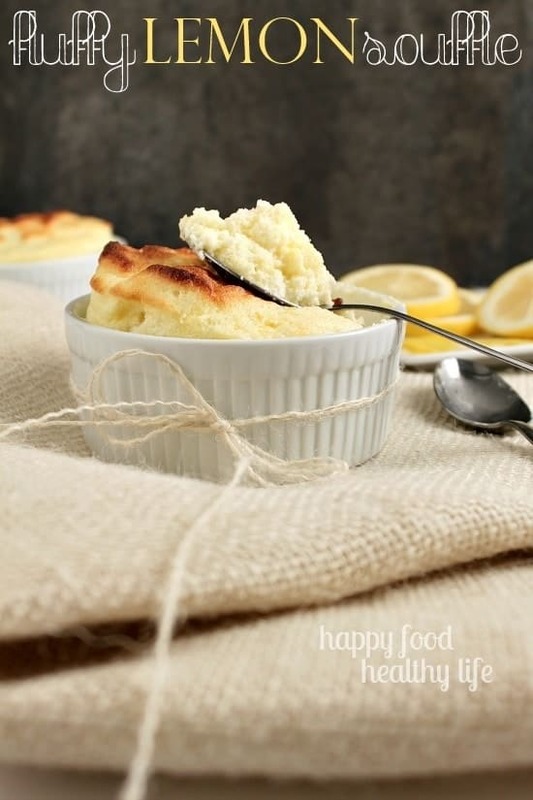 She just loves lemon, and while she’s been away, I’ve made a super tasty lemon chiffon pie and now this souffle. Please don’t tell her, mmkay? You guys, the flavor just POPs in this one! It’s summer in your mouth. You can taste the rays of sunshine beating on you with every bite. But there was this one disastrous thing that happened after I photographed these beauts………. keep reading…. Preheat oven to 350 degrees F. Lower oven rack to bottom of oven. In a 2-quart mixing bowl combine, sugar, butter, flour, salt and milk, mixing until smooth. Add egg yolks to this and mix until smooth. Add lemon juice and zest. In a mixer, beat egg whites until peaks are stiff. Fold the yolk mixture into whites gently to combine mixtures. Using butter, grease two 6-inch custard cups. Pour the mixture into the cups. Set the cups in 1/2 inch of hot water in a baking pan that will fit the two custard cups. Bake on low oven rack for 20-23 minutes or until tops have risen and turn golden brown. Right, so I’m getting my mad photo skills fake-it-till-you-make-it photo skills on. It’s all fine and dandy. Then I share a bite or two with my kiddo. I have full intention of eating these two souffles on my own. Then I stack it all up to take back downstairs. Something slips. Something horribly wrong happens. And I have upside-down souffle all over my floor. I could practically hear my wife saying, “Damn it! If I can’t eat lemon desserts while in boot camp, well then neither can you!” All I could do was laugh, thank my lucky stars I got in some good shots, and clean up. I sure can’t wait to share both this story and the souffle with my wife when she returns. This. looks. INCREDIBLE!!!!! I have never tried a souffle either . . . you make it look so easy! I was surprised at how easy it was!! even if it did deflate just a bit. Your photos look great Holly!! Don’t discredit yourself girl, you own those mad photo skills. it’s surprisingly not that hard at all! i was so nervous, but it all worked out! i hope you give it a shot too. 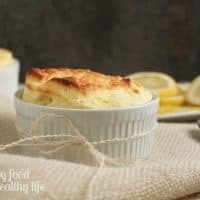 I love souffle and anything lemon! I’ll have to pin for later. How sad that you dropped them! 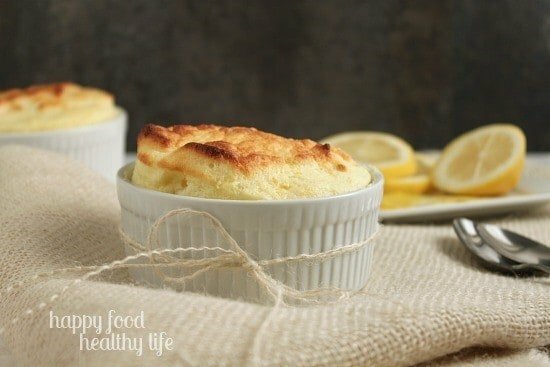 I’ve never tried a soufflé either, but these look delicious! I’m loving lemon too – so bright and cheery! This looks delicious, Holly! Can’t wait to try it. Thanks!